ICYLUAR, “One Buffalo” has become our city’s I <3 NY. When the One Buffalo campaign was launched by Kim Pegula in 2014 in an effort to bring together the Buffalo community, unify our sports teams and promote our city, it was clear the powerful phrase (and movement) was bound to be a phenomenon. As to be expected, Buffalonians adopted the phrase and passionately posted it on everything from billboards to t-shirts, and now to our taste buds’ delight you can ~eat it~ courtesy of Perry’s Ice Cream. That’s right, in a total embracement of One Buffalo Perry’s has done us all a solid by creating a new flavor that combines some of our favorite Buffalo foods…IN ICE CREAM. And what better way to unify a city than through ice cream, amiright? 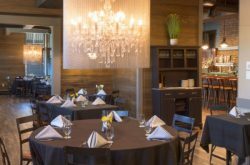 Born as the brainchild between Perry’s and fellow ice cream-lover Kim Pegula, a woman after our own hearts, Perry’s One Buffalo flavor is epitomizing everything we love about this great city both in its ingredients and in its message. The new flavor consists of vanilla ice cream loaded with swirls of sea salt caramel, sponge candy pieces and fudge-coated pretzels, making it sweet and salty just like us Buffalonians. The flavor stays true to Perry’s mission of putting “enough of the good stuff” in its ice cream so that every bite is more amazing than the last and YAAAAAS IT IS GOOD. We’d even go so far as to say it’s the greatest gift Buffalonians have ever received in a quart-sized container in the history of ever. Thank you, Perry’s! 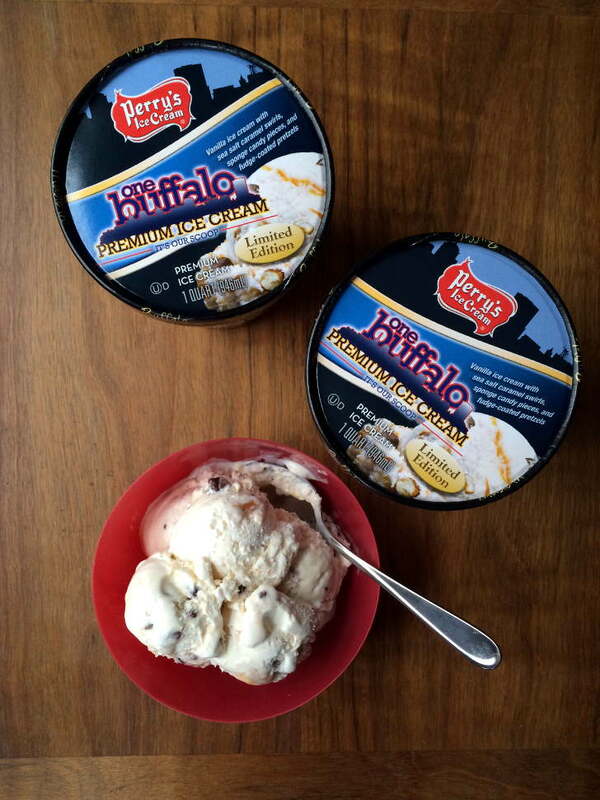 Perry’s Ice Cream is known for their exceptionally creamy texture and taste, and One Buffalo is no different. That’s because all of Perry’s products are made the same old fashioned way (minus the hand cranks and horse-drawn delivery wagons) by the same family who founded it 97 years ago. Yes, you read that correctly; Perry’s is still crafted in Akron, NY one batch at a time and slow cooked to give it that unique, old fashioned taste you fondly remember begging asking your parents politely for. 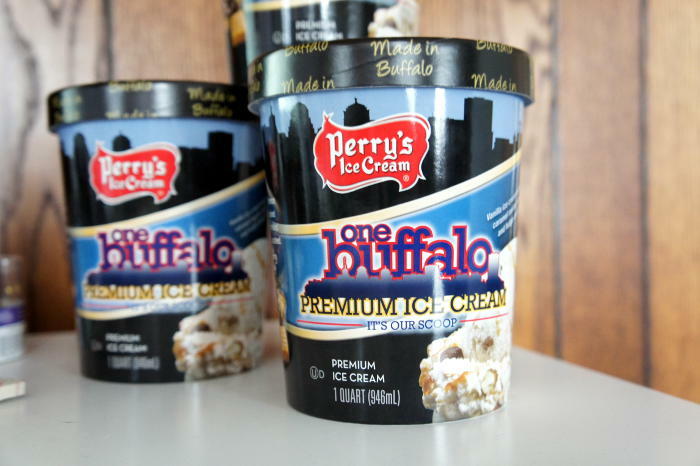 You may have been #blessed to try Perry’s One Buffalo flavor when it was released last October at the First Niagara Center and (716) Food and Sport, and now you probably lie awake at night wondering when you’ll get the chance to take that deliciousness home. 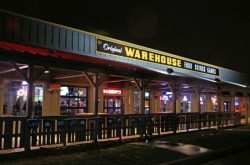 Well good news: now you can also get the One Buffalo at stores across the area (click here to find the closest store to you!) AND it comes in a quart aka the perfect size for uno. Blame it on that sleek, classic black packaging that seduces us every time we’re at the grocery store but it’s almost hard to believe that Perry’s, *the Perry’s*, is still made with TLC here in Buffalo. Quick ice cream fun fact: 100% of the milk used in Perry’s products comes from local farms within a 50 mile radius of Akron. So when you cave and put that rich, creamy, delicious container of Perry’s Ice Cream in your shopping cart, relish in the fact that you’re supporting a local company AND local farmers and their cows. Just call that the figurative cherry on top of the ice cream sundae you’re going to eat as soon as you get home. 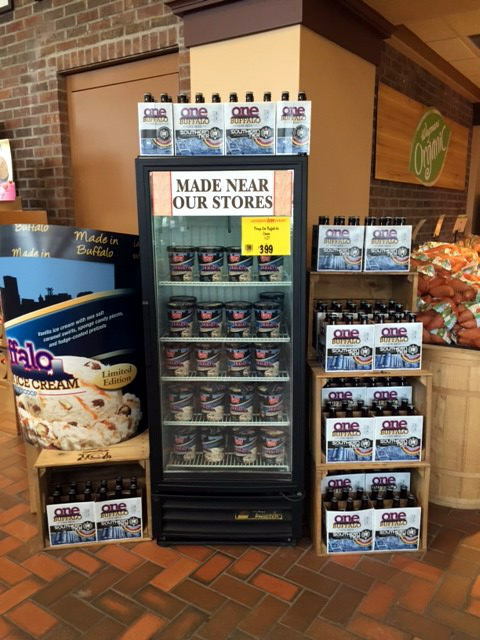 Look for Perry’s One Buffalo at Wegmans, Tops, and other local retail stores and let your taste buds finally experience the pride and love the rest of your senses have been enjoying in our great city! 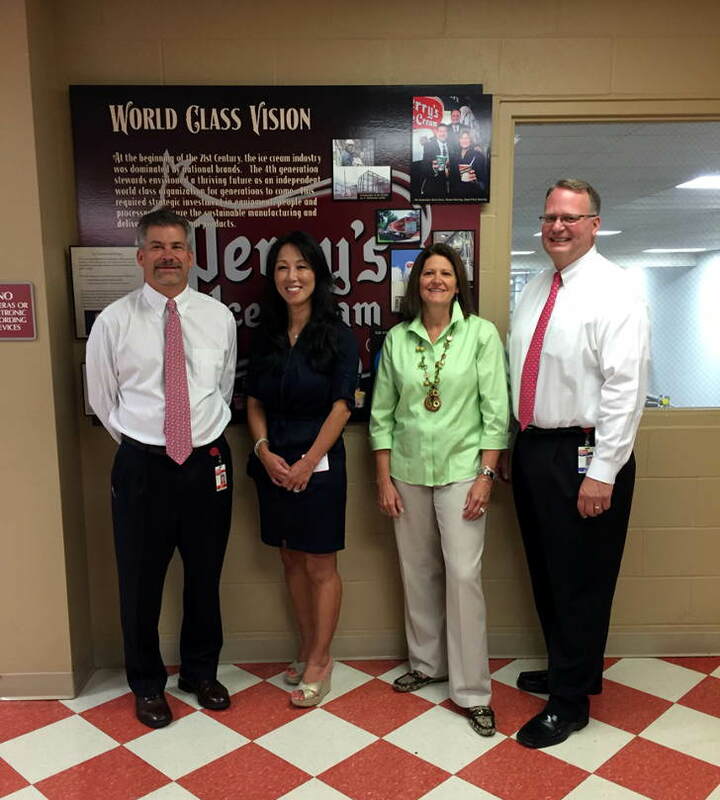 Perry’s Ice Cream is locally made with love in Akron, NY. For more information check out their website and Facebook page or head over to their Flavor Finder to find where you can grab your quart of One Buffalo today!